Martin Parr in conversation with Sunil Shah. I’ve been a photographer for over 40 years. I was born in Epsom. The advantage of being born in Epsom is it makes everything interesting. …and when I was a kid… he was the person who got me interested in photography. I moved to Hebden Bridge. …it took me 35 years to get it published. This is Crimsworth Dean Methodist Chapel. …he used to put up curtains. I was moved by this gesture. So in the 80s, 1982 I changed from black and white to colour. That’s the beach at New Brighton. Another view of the beach. …I urge you all to document things that change. Then you can see what bad taste you had. This is also M&S, and the graphics have changed. …in the centre of Brockley. …the middle classes got overlooked. …Bath and Bristol, middleclass heaven. I really don’t like craft fairs. …these are coats for teapots. This is like a self-portrait. …and I just wanted to bring in Scotland. I’m doing a big show in Aberdeen. I’ve been to virtually all inhabited Scottish islands. It’s very rare for me to make photographs in Bristol. …one of those insurance companies. He’s the modern Martin Luther King. …I’ll meet you outside Primark. I’m looking for hot spots. …50 years ago they had seventy-five staff. This is one of the temples. West Brom has an 89p shop. Many of the pictures you reject have documentary value. Now we come to the British season. Here we are at Goodwood. This is Queens Club, Henley, this is the establishment. …and boy do they have a big party when they leave. This is the City of London. London is a very feudal place. This is the Lord Mayor’s Parade. I am the Pizza Queue. This is continuing at 5am. …and this is a brief summary of some of the work I’ve done. SS. Thank you Martin… …trip through your photographic life. I wanted to make a link with the show outside. There are two references to you in the show. I was trying to draw some similarities… …of Englishness. Are you looking for a quintessential Englishness? MP. …think of England, we think of clichés. MP. I have a higher profile in France. We still can produce terrible food. Contemporary galleries don’t often show photographers. SS. …documentary was also about me. Anyone who is a photographer has to like people. …I love and hate this country equally. Things like ‘The Last Resort’ was a statement on politics. …anyone interested in people is from the left. SS. Is that something you would take into consideration? MP. Well I don’t have to. I’m editing because that’s a better photograph than the next. I used colour film and flash. The pictures almost look like advertising. They had the John Hinde postcards. SS. You were very radical… turning the camera back in on England. You shot the working class. MP. Controversy never does you any harm. Why can’t we photograph a funeral? SS. These rules haven’t changed much. We’re used to TV using horror. MP. I regard myself as a British photographer, part of my arsenal is horror, comedy and mischief. SS. Any situations where you don’t find that humour? MP. I want to go at its busiest. SS. When you turn up… you are a big tall man. You have a camera around your neck. MP. The thing that drives you mad is they start posing. All these really bad photographs get uploaded. I love things like Instagram. SS. I’ve got a serious one. What is the role of social documentary? MP. It helps to tell us who we are. …although you can have images, you have to have the back stories. SS. 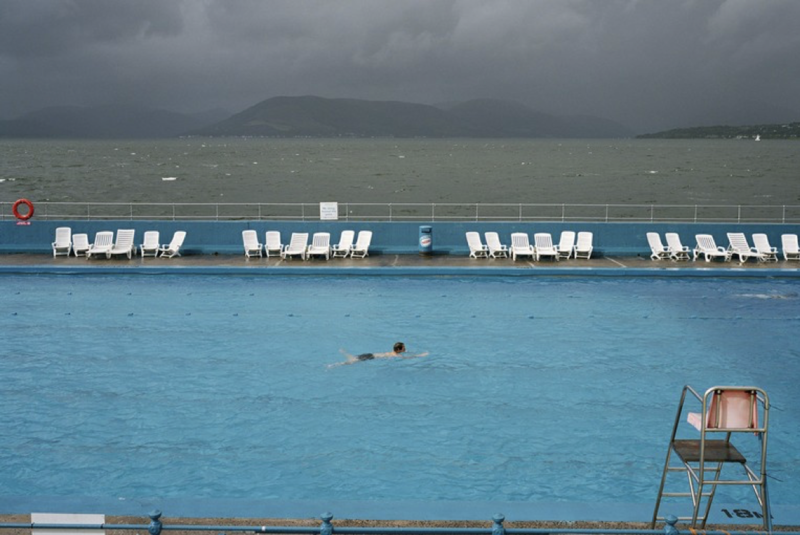 Perhaps we can talk about the Martin Parr Foundation? MP. I launched the charity four years ago. I knew I needed a building. This is all being paid for by myself. I can put on the things that the Arnolfini and Spike never put on.